I do miss photographs in this book, helps to give you an idea of what the final result is meant to look like! I assume these are what we think of these days as finger rolls.. I found quite an interesting definition of these; apparently they date back to 1926 but made a decline in popularity in the 1960’s but they were popular at bridge games, hence the name!! 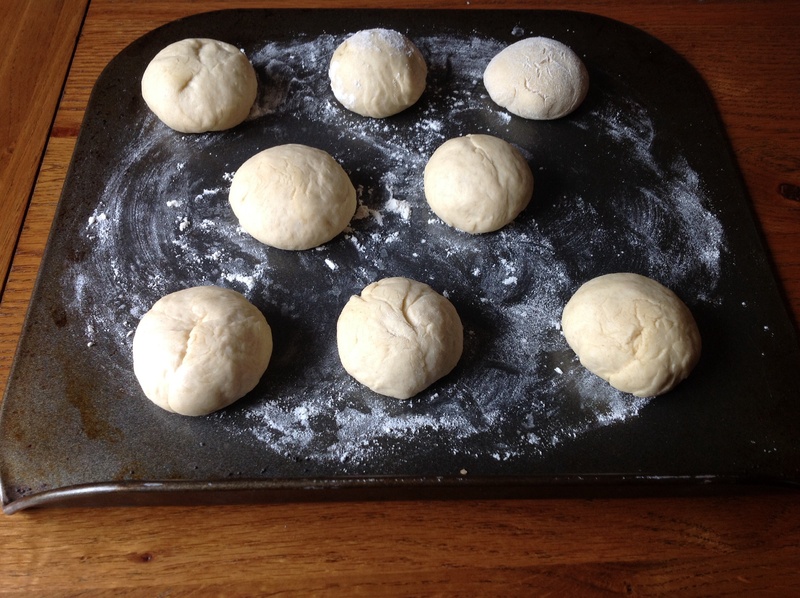 Anyway first off I rubbed the fat into the flour and salt..
Then I added the milk, egg and yeast and formed into a dough. 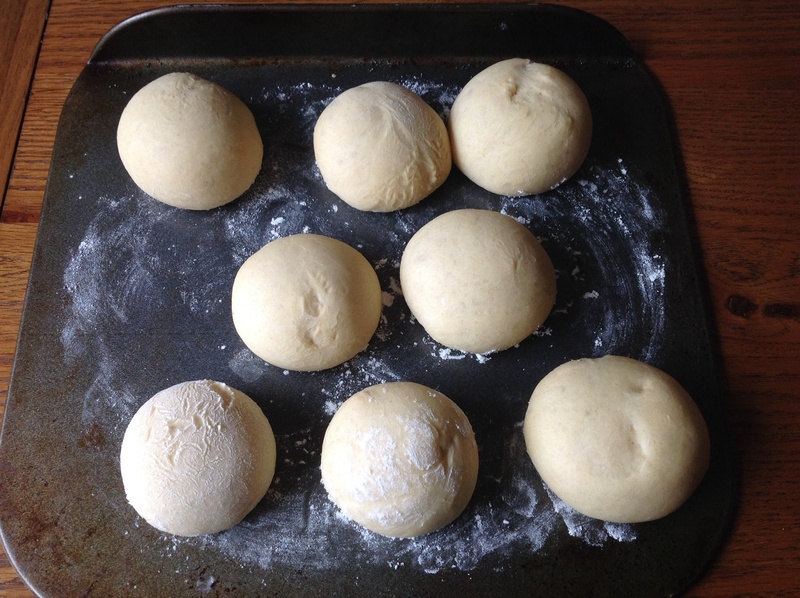 I didn’t knead for too long, just long enough until the dough was smooth..
After about 2 hours of rising I shaped them into fingers..
After slightly longer than 20 minutes they had risen slightly more and almost joined together..
Then it was into the oven for 20 minutes.. They have joined together a bit more whilst cooking but do think they should’ve been even closer.. 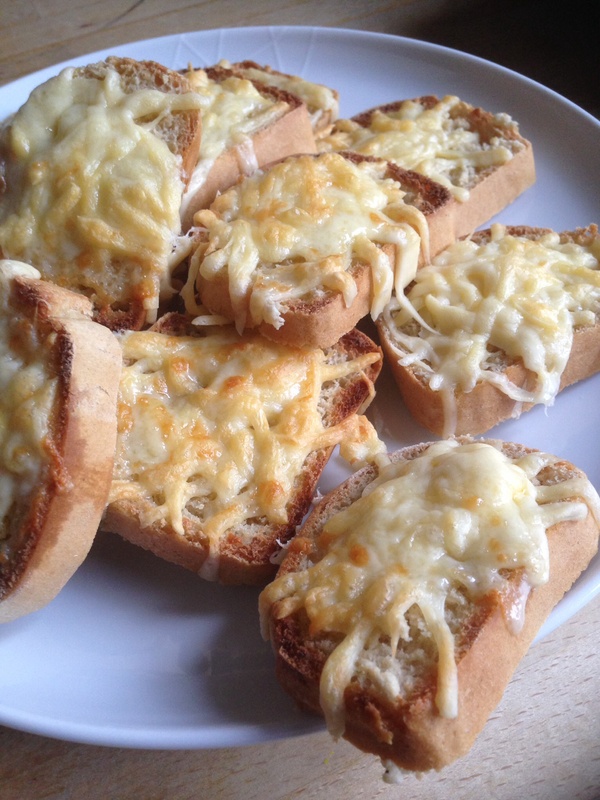 I left them to cool for a bit and then we had this with a variety of fillings for lunch..
Would I make these again? 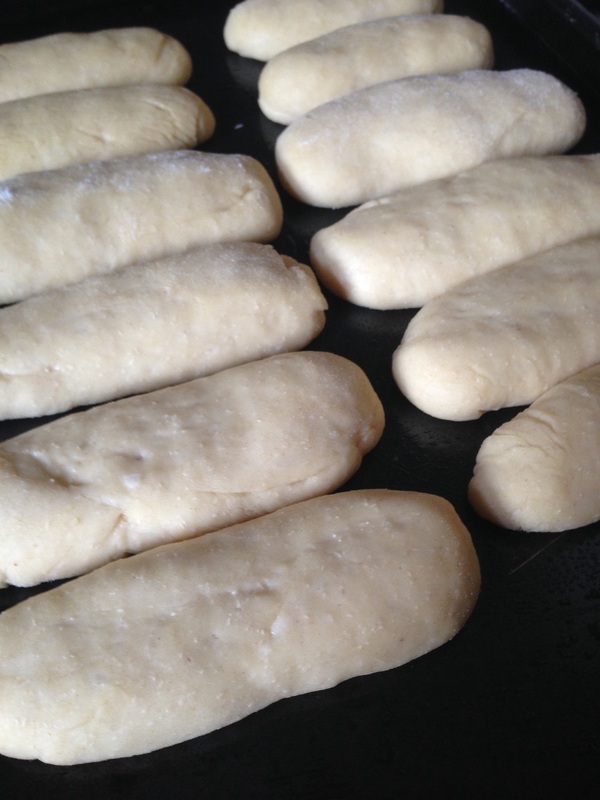 Yes, another easy bread recipe made with plain flour.. I fancied cheese on toast for lunch today but decided to fancy it up and make this instead!! 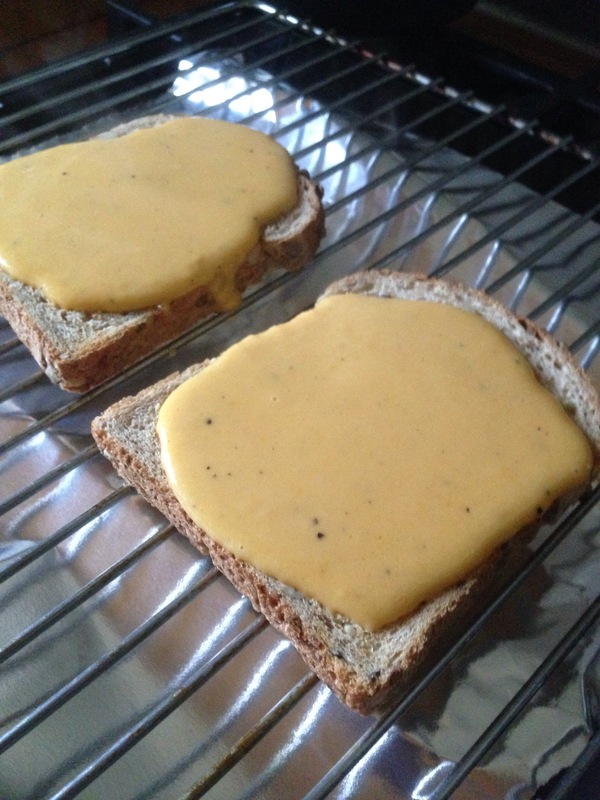 I’d never heard of buck rarebit before, I guess if you like poached eggs it would be a nice addition on top. 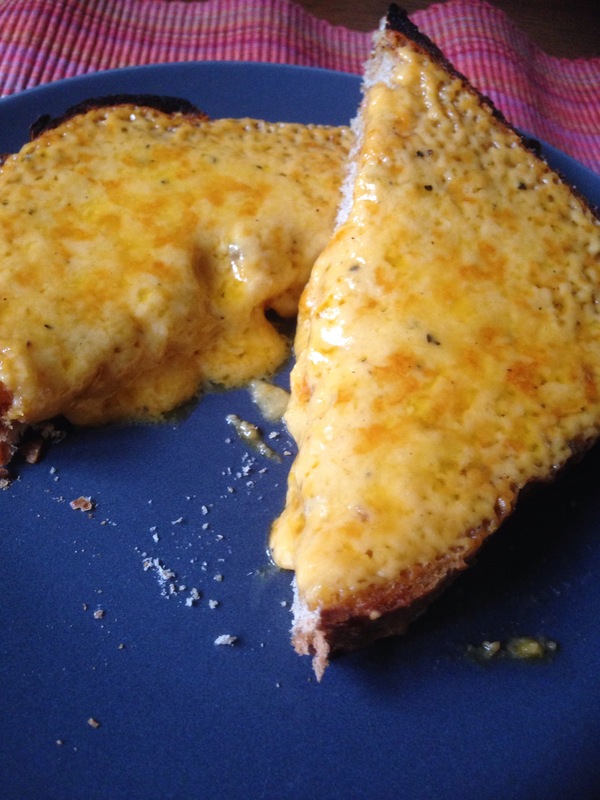 I didn’t fancy having the egg on top so kept it just the regular rarebit! 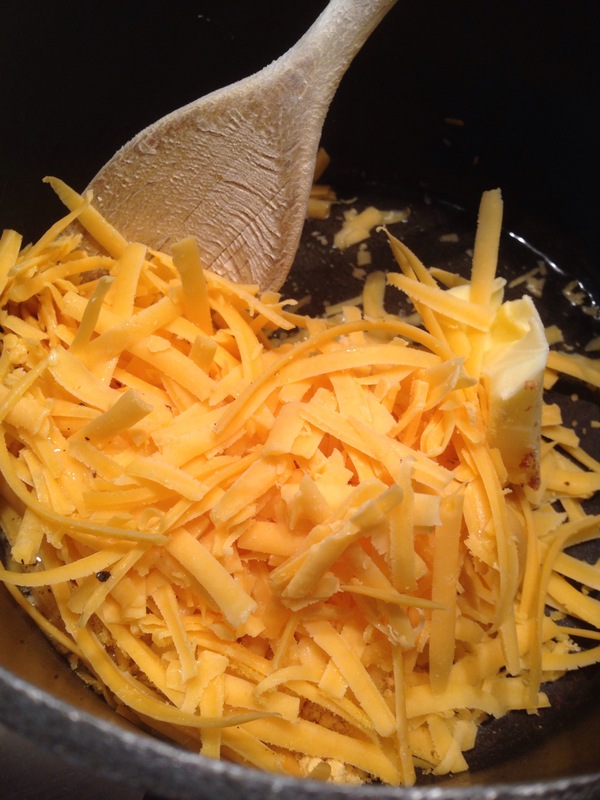 I started by putting the cheese, mustard, seasoning and ale into a pan to melt..
Once it had all melted together it seemd a bit runny! I was picturing it all pouring off the sides of the toast, but thankfully seemed ok, only a few drips down the sides! After only about 3 minutes under the grill it was golden and bubbling.. So this was lunch. 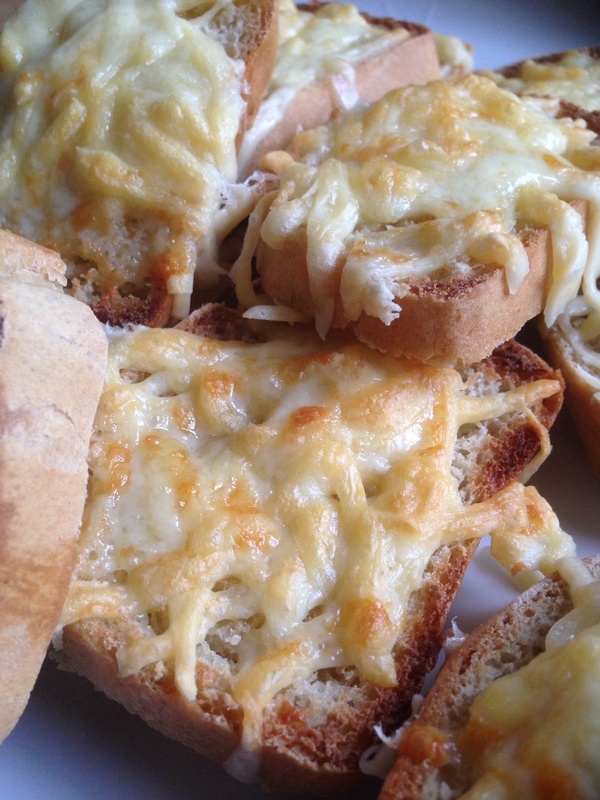 I think it’s the kind of cheese on toast that you need to eat with a knife and fork! Really not much to say about this expect that it was good! 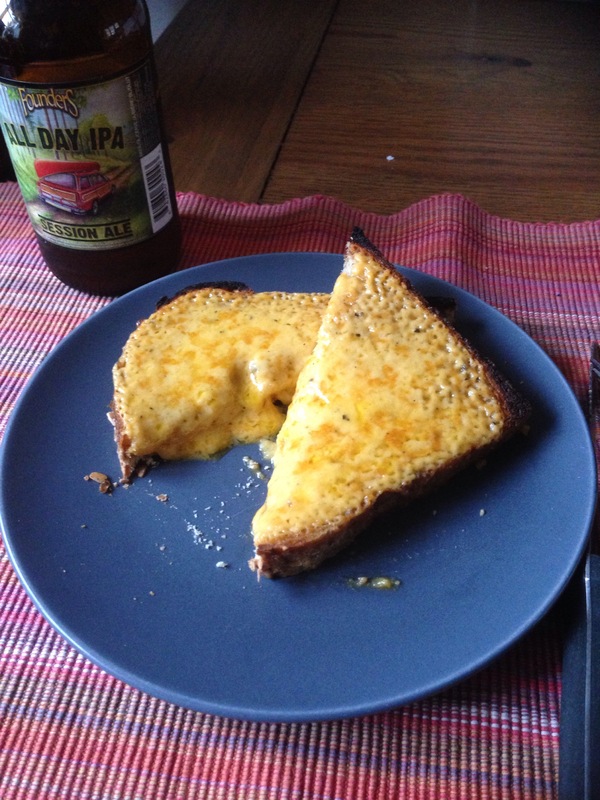 You could taste the mustard and the ale which was nice, the only criticism is that I didn’t make enough..
Would I make this again? Yes, I obviously had to finish off the ale with my slice…. 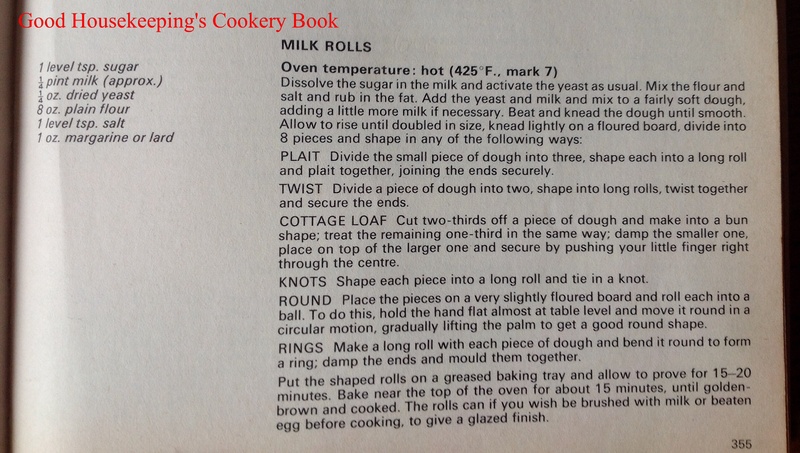 All the bread recipes from this book use plain flour, I think I’ve mentioned before but the start of this chapter does talk about bread flour but says it’s not readily available and you’d need to ask your baker for some! 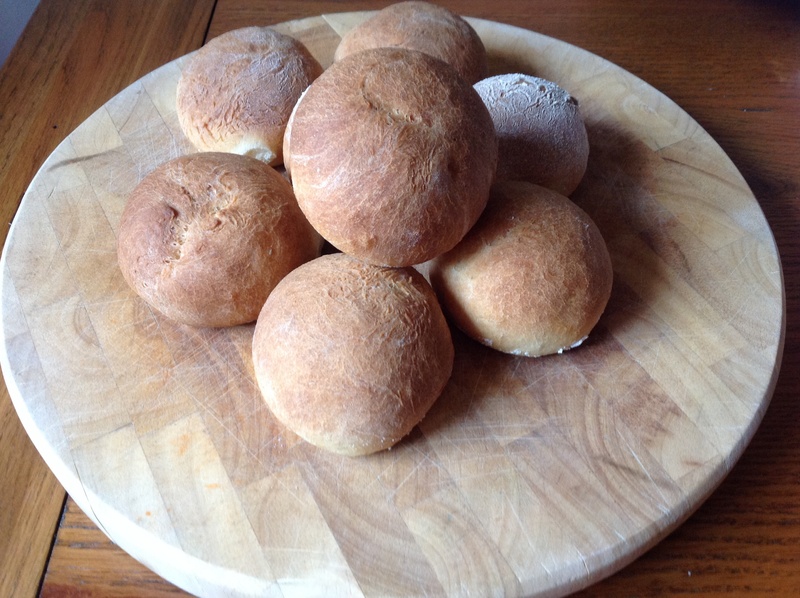 Now it obviously is available but for these bread recipes I opted to stick to plain flour to see how I get on. 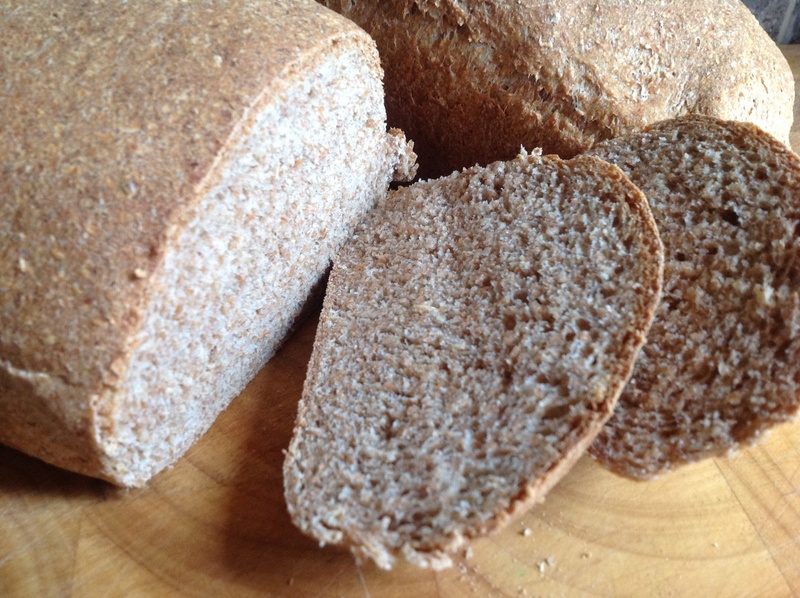 I have already made the quick wholemeal bread which turned out ok, so today we had no bread in the house and no bread flour so thought I’d try this.. I didn’t activate the yeast as I used fast acting stuff. I had tried to get non fast acting dried yeast but my local supermarket only had the fast stuff! I did add a little extra water than the recipe suggests..
After a good 10 minutes kneading my arms are tired but it was looking nice and smooth.. I think the quick part of this is that it’s not given a second rising stage. Once kneaded it was straight into the tins, then it does say to leave till the the dough fills the tins, but that could take a while if you use different sized tins like I did! I did wonder if I left them too long as they looked a bit weird..
Maybe I’ve over proved them?? Anyway I carried on to the baking stage. The start of this chapter has all the details about baking; it’s 15 minutes at 220 then reduce to 200 until they’re ready. I think my loaves were ready after about 30 minutes. 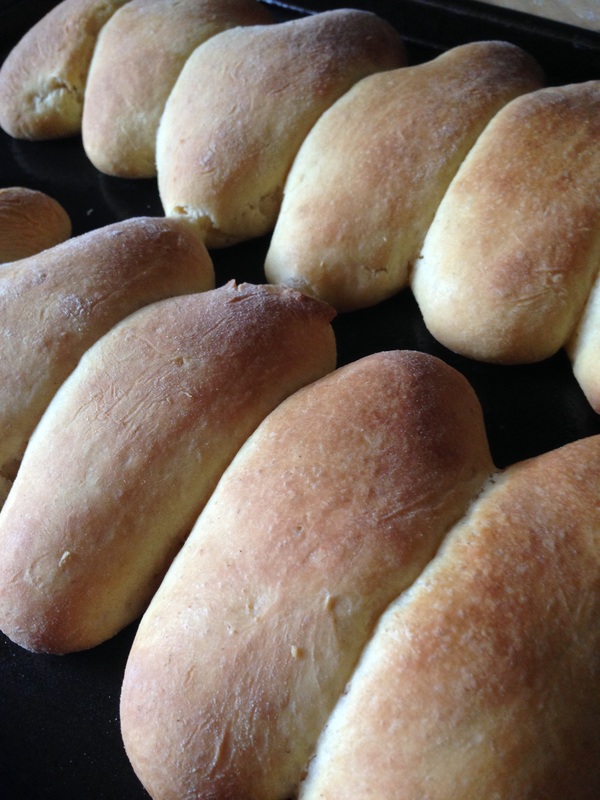 This smells just as good as any other bread recipe, but there is a note to say bread made using this quick recipe does not have such a good appearance or so even texture as bread made by other methods! 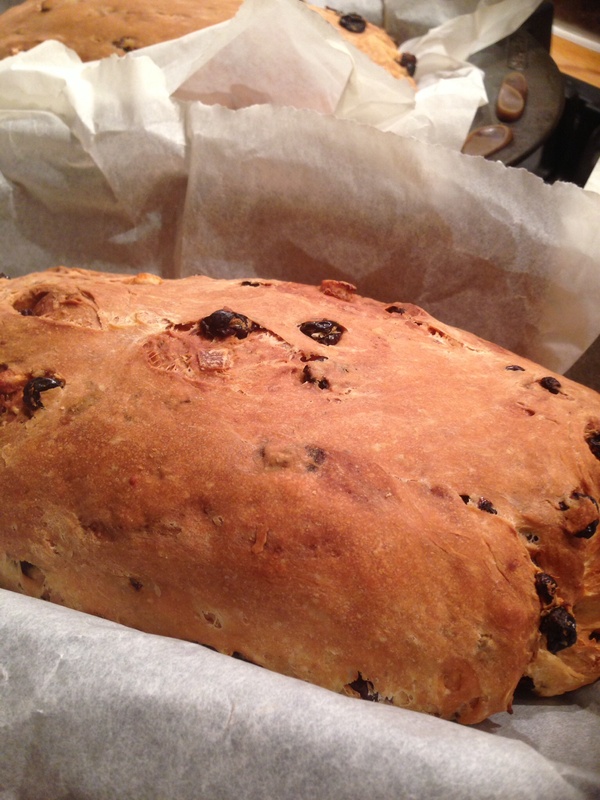 It looks ok once out of the oven..
Left to cool for only a few minutes before I sliced to try a bit.. It does have quite a crust on it, which I actually quite like, but the inside is nice and soft. 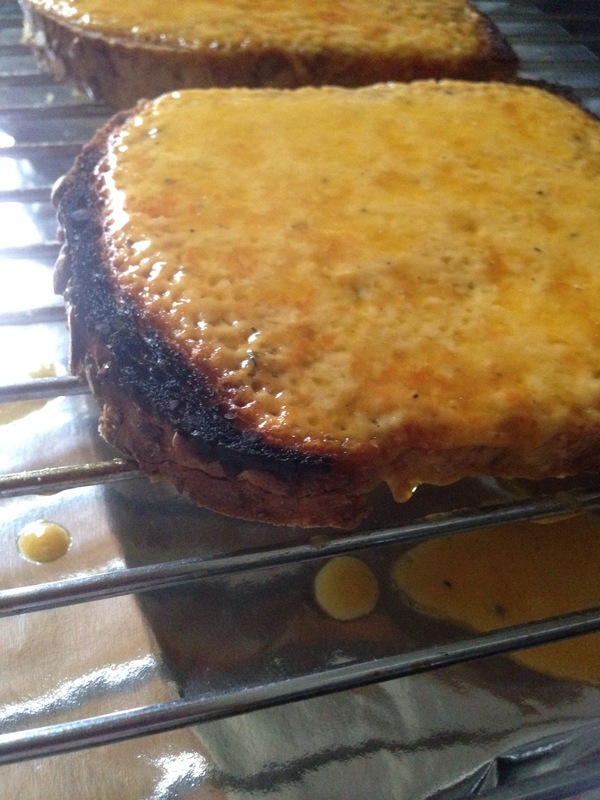 It’s maybe not fit for sandwich use, but we had toasted with cheese and was ideal for that! I think it does need to be toasted or dunked in soup to soften! Would I make this again? Yes, if I had no bread flour and wanted some toast! 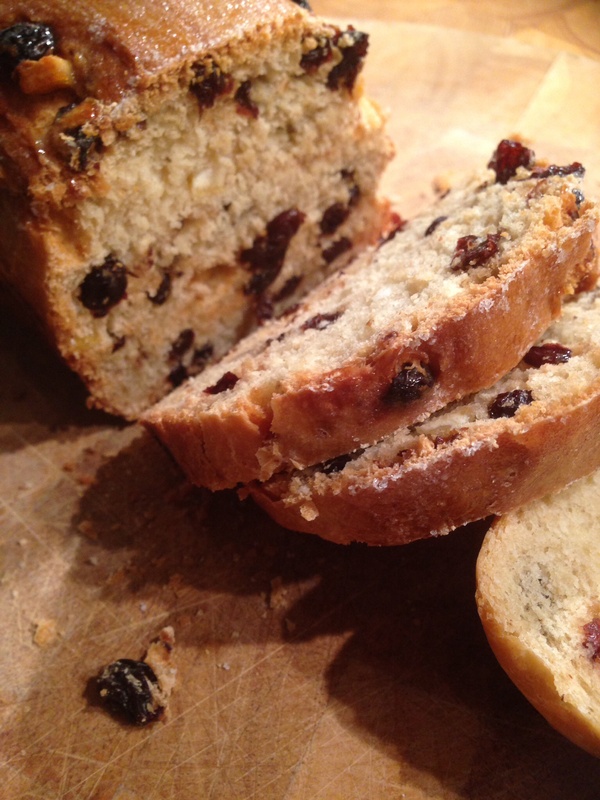 I have a fruit loaf recipe that I think came from my mum that I make loads, it’s packed with dry fruit and do love it! 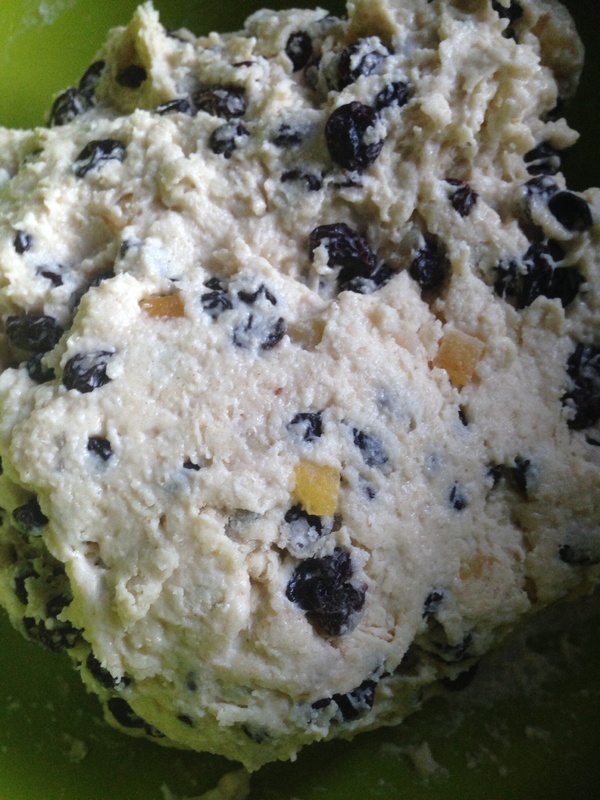 So thought I’d try this recipe for a change of fruit based bread! 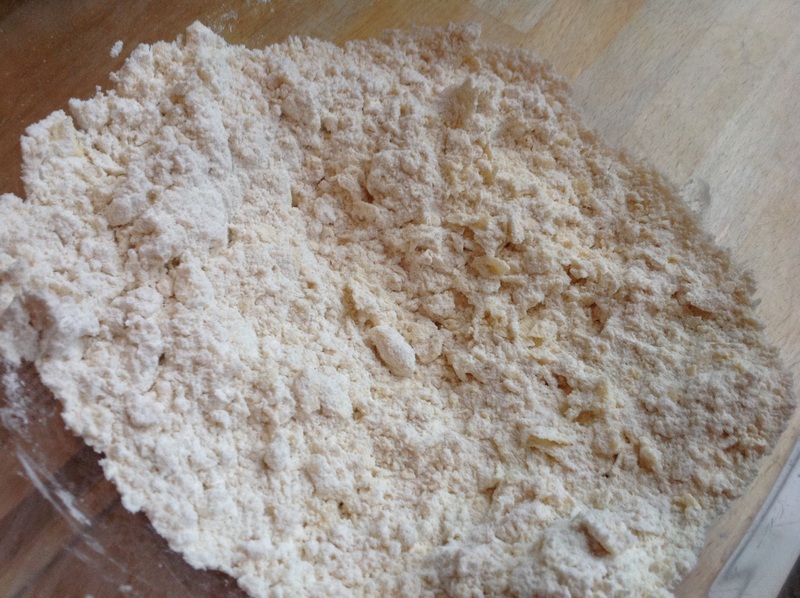 This is another bread recipe that uses plain flour rather than bread flour, it’s also tells you to activate the yeast but I was using fast action yeast so didn’t need to do that step. I was tempted to add some cinnamon at this stage.. 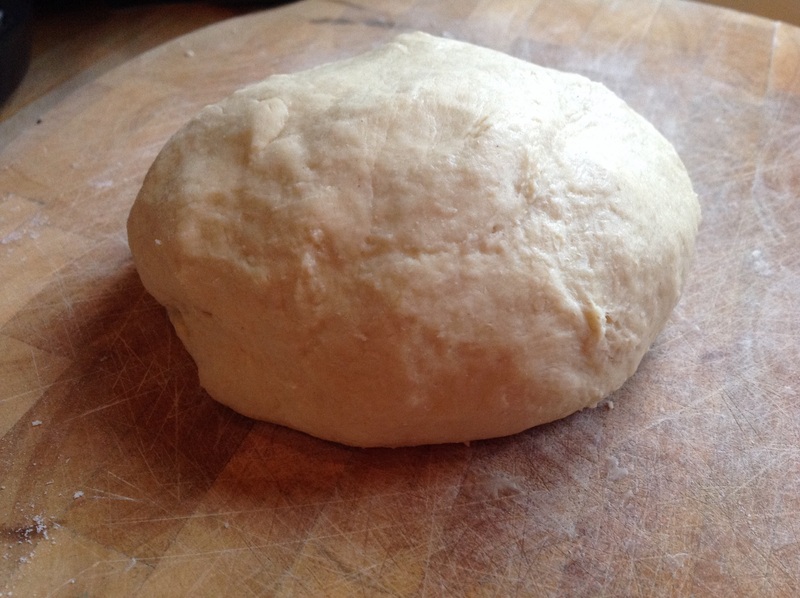 I did add the full quantity of milk and was worried my dough was a tad wet..
After a good dose of kneading it was looking much smoother and I set it aside in a warm place to rise. I didn’t actually time how long I left it but it was a good while before it had doubled in size.. 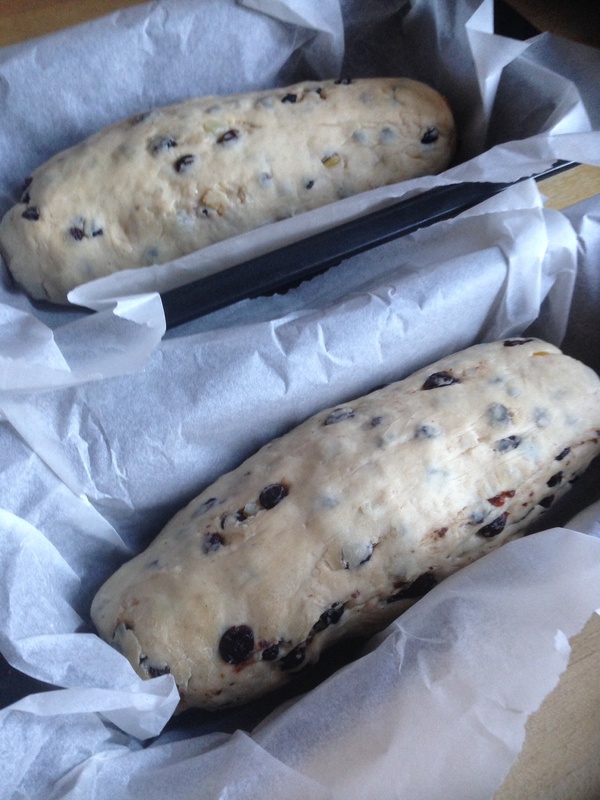 I have two slightly different shaped loaf tins so just used them and rather that grease and flour them I opted to line rather haphazardly with grease proof paper.. I then left them a bit longer than the recipe says, again I didn’t time how long I left them but was dark when I went to put them in the oven hence the photo looks completely different..
After 40 minutes in the oven they haven’t risen much more, but smells pretty good and looks a nice dark brown colour.. I opted to add the sugar and milk glaze.. I left to cool only slightly before slicing..
Ordinarily I’d be having this warm with butter but I’m trying to be healthyish this month so not eating butter! On it’s own this is good. 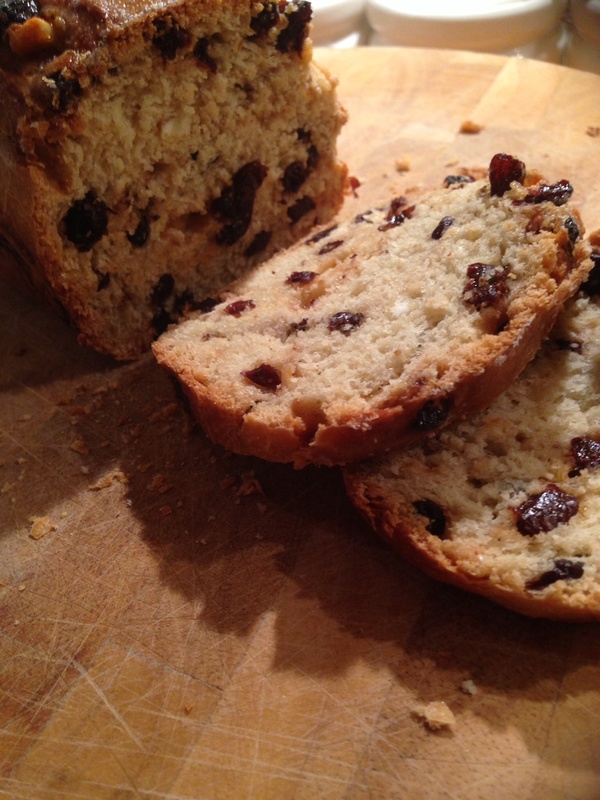 It’s not sweet like a tea bread normally is as there’s not much sugar in it. We had with jam and was nice, but I can only imagine how fab this would be toasted with butter! I had made the wholemeal bread a few months ago and it turned out ok, I had made that with just plain wholemeal flour, so today I thought I’d try this one to compare..
So,I guess the thing that makes this quick is that it only has one rising stage, so the actual quickness if this bread will depend on how long you leave it for that! 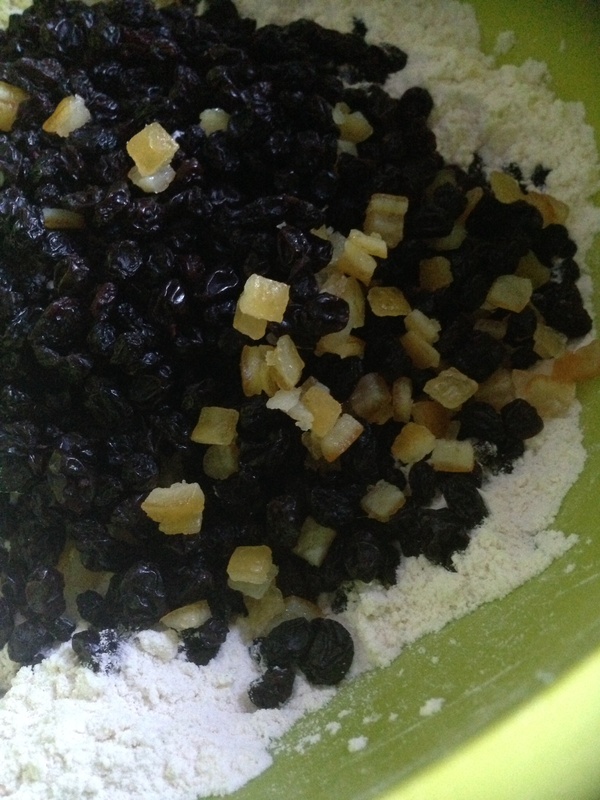 The initial mixing and kneading took about 15 minutes, then rather than put in tins I opted to make rounds.. I don’t know exactly how long I left this but by about an hour they had almost doubled, my house is quite warm so maybe that sped up that process! I do love the smell of bread baking and it was smelling so good that it interrupted my daughters playing as she had to come downstairs to find out what the nice smell was!! 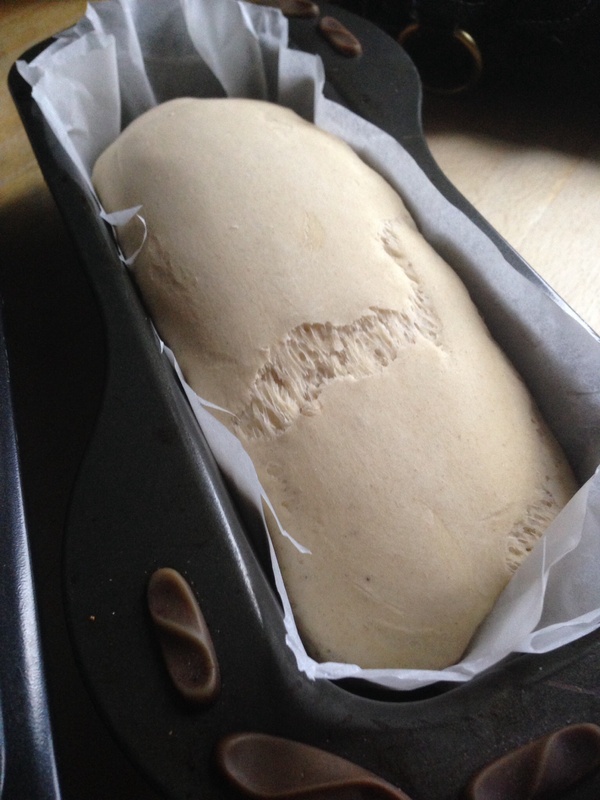 They didn’t rise much more in the oven and aren’t the biggest of loaves, so I guess you could try just leaving as one rather than splitting into two. 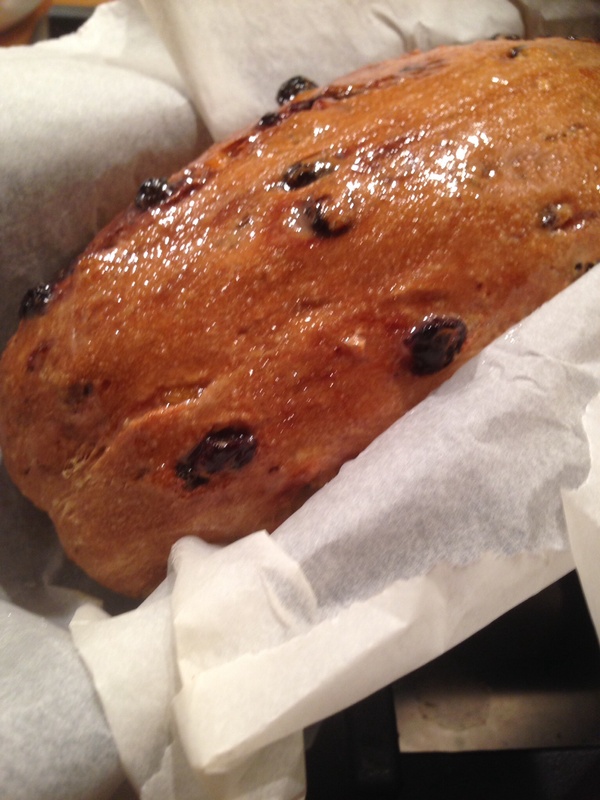 I obviously had to try a slice of this warm from the oven with butter and was brilliant – but then most things warm from the oven taste good with butter in my opinion!! 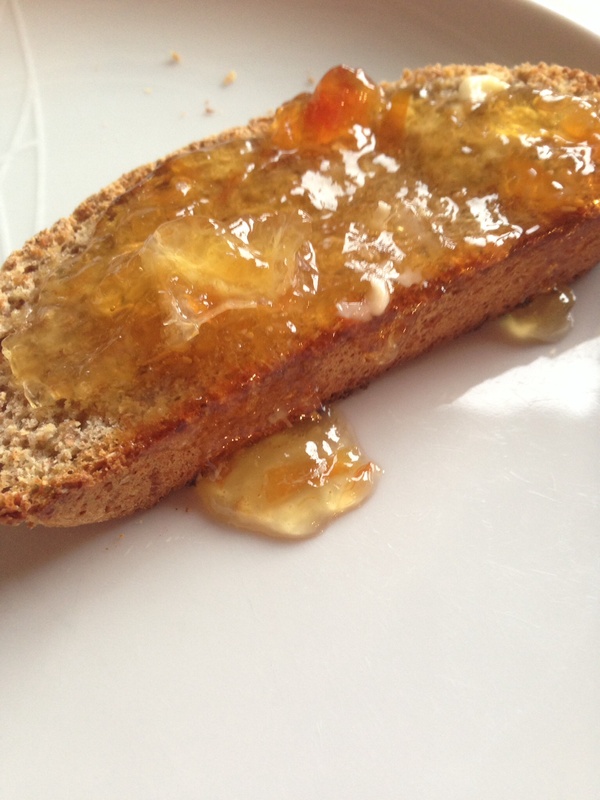 Once cooled I had some toasted with homemade grapefruit marmalade and it’s great. Would I make this again? Yes, easy and relatively quick!! 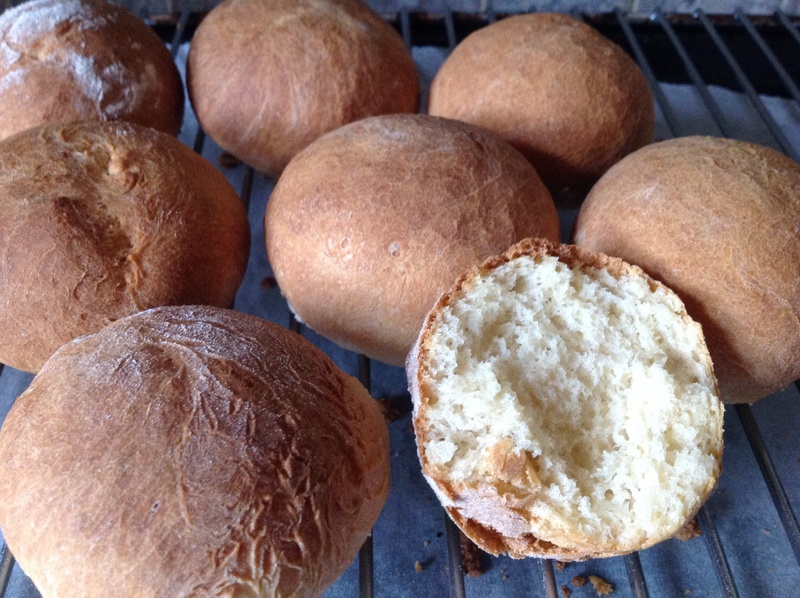 I think I’ve only tried to make rolls once and it didn’t go to well; they were like rocks!! 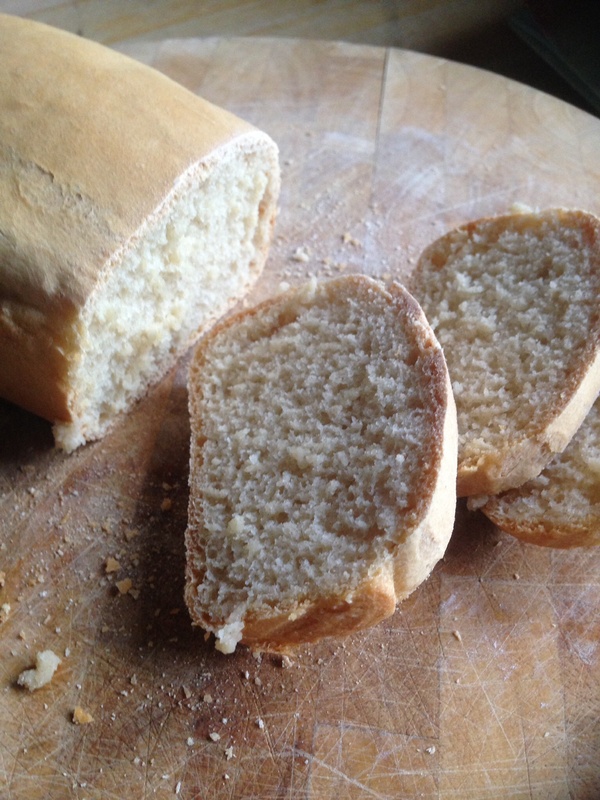 This turned out slightly better..
Again this is another bread recipe that uses plain flour rather than bread flour, would be good to try with bread flour and see if that does make a difference. 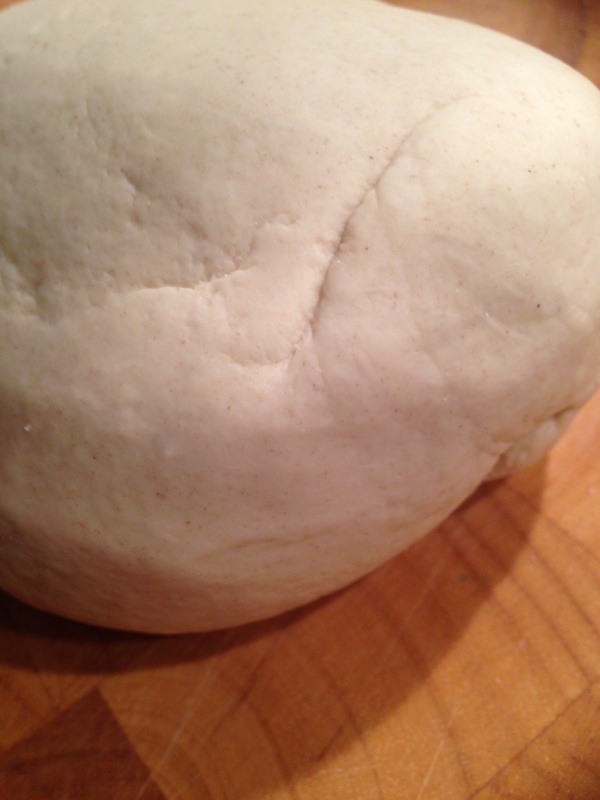 I made the dough earlier in the morning and left for a couple hours to double in size. 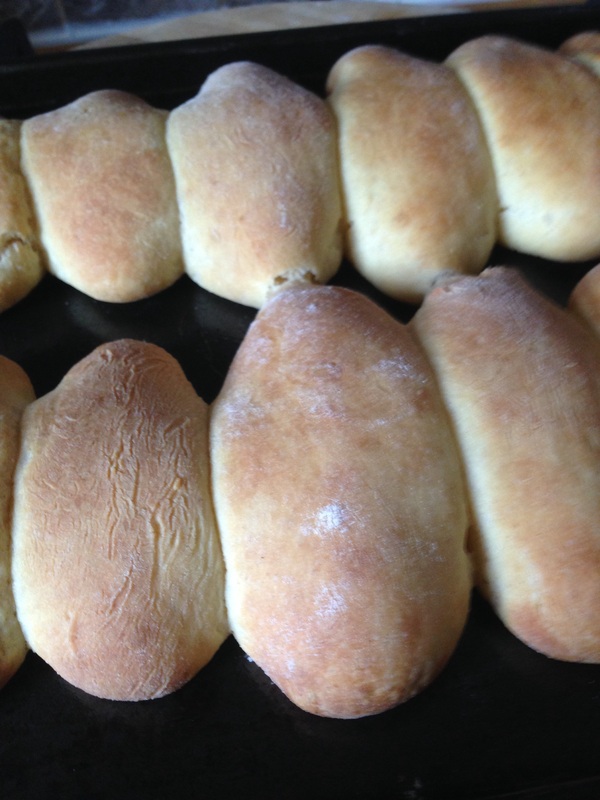 I decided to just do round rolls rather than any of the other shapes. I don’t think I made a very good job of shaping them! I just couldn’t get them to look nice and smooth! They cooked really quickly, I was worried I had actually left them in a bit too long as they are more of a dark brown than golden brown! 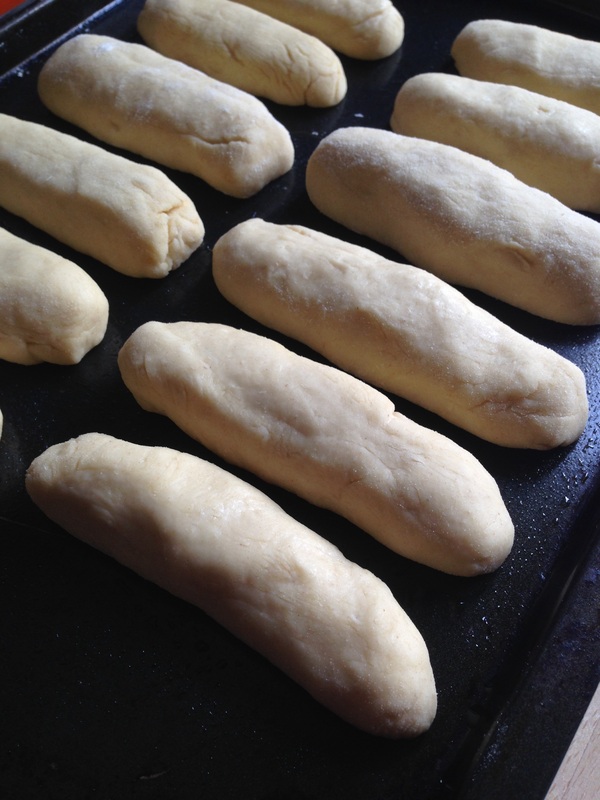 They didn’t rise much more in the oven. I obviously had to try one warm form the oven, and despite the dark colour they are really lovely and soft and light inside. We have loads of leftover lamb from last night so may have a few rolls and lamb for tea! Would I make these again? Yes, will try some of the other shapes next time! 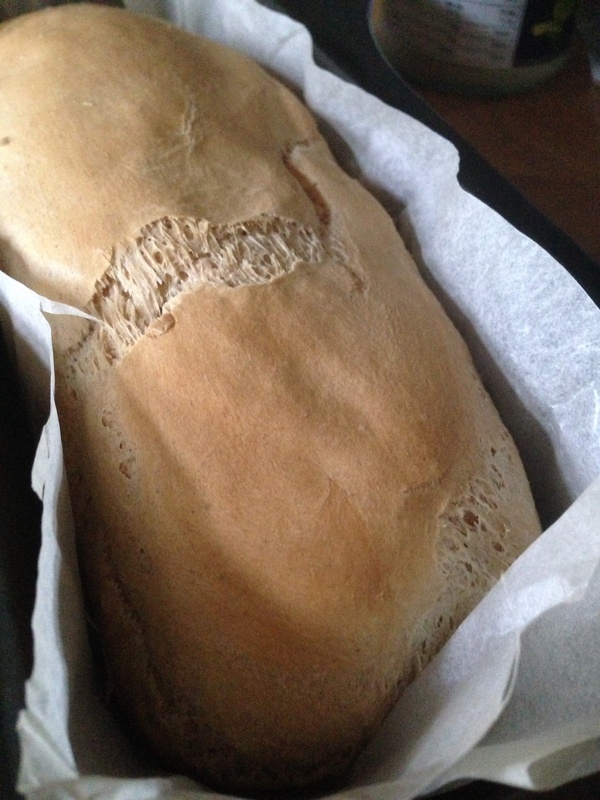 I made white bread a while back and I used regular plain flour rather than bread flour and it turned out ok, so thought I’d try this loaf today..
As I mentioned in the white bread recipe the book does talk about bread flour, but it says you would need to go to the baker and ask them to order for you and it’s expensive. Obviously nowadays we can get loads of different bread flours, but it’s good to try and make a loaf with the most basic type of flour. 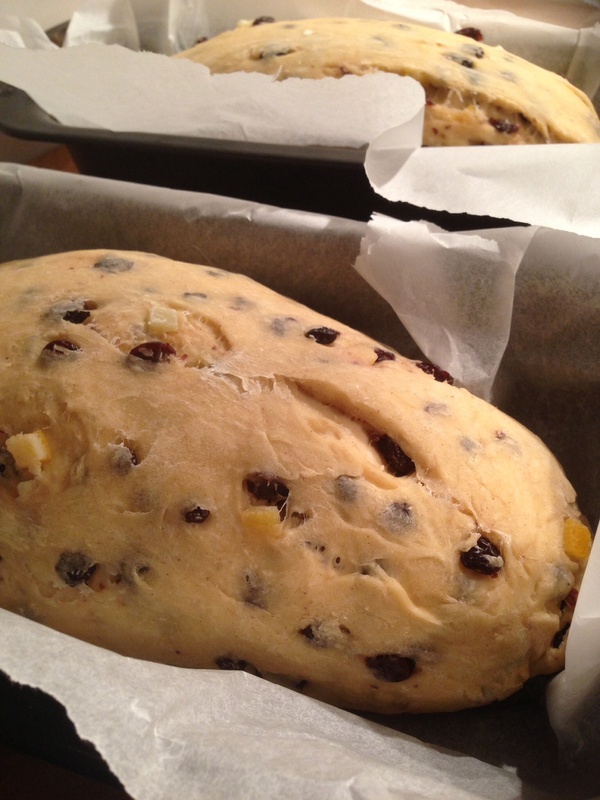 I halved this recipe and I got 2 small loaves. 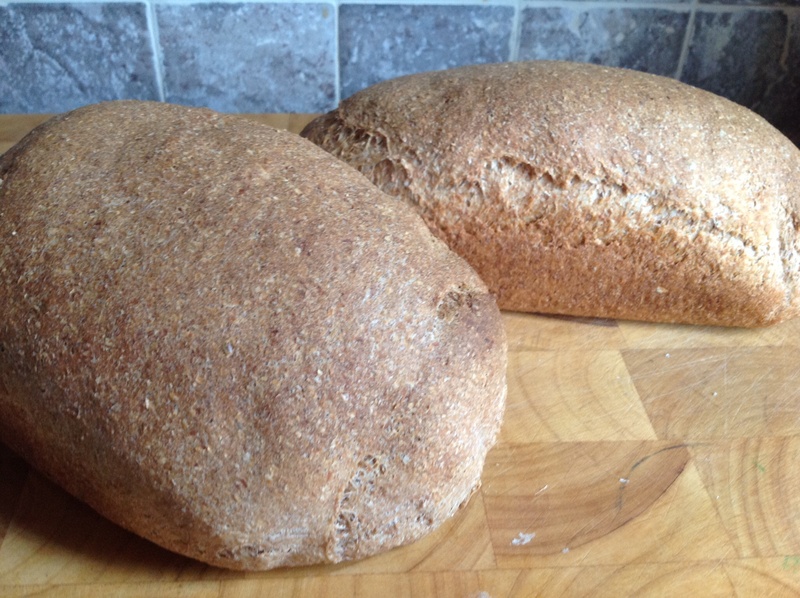 I also used all wholemeal rather than a mix. 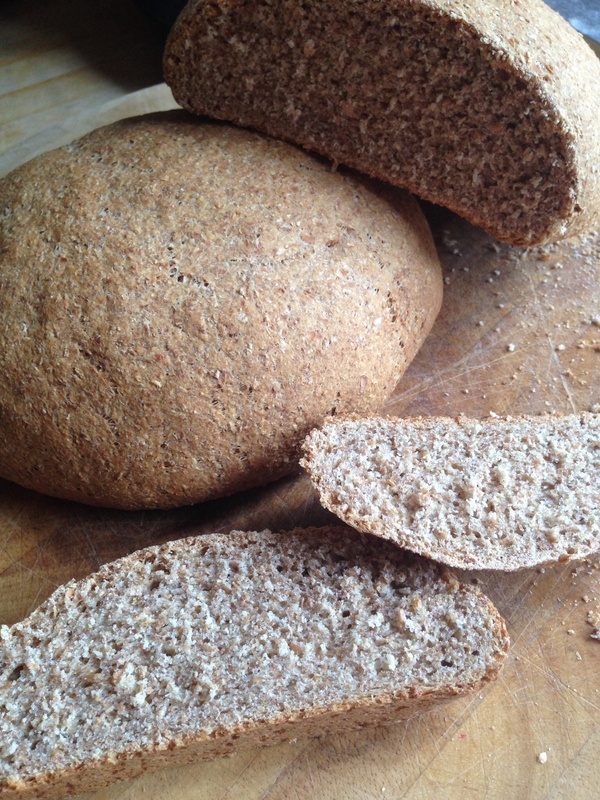 I had been watching a programme this week about the contents of food, and one thing they had been talking about was wholemeal breads. Apparently a lot of the brands of wholemeal bread in the supermarkets also contain other types of flours. 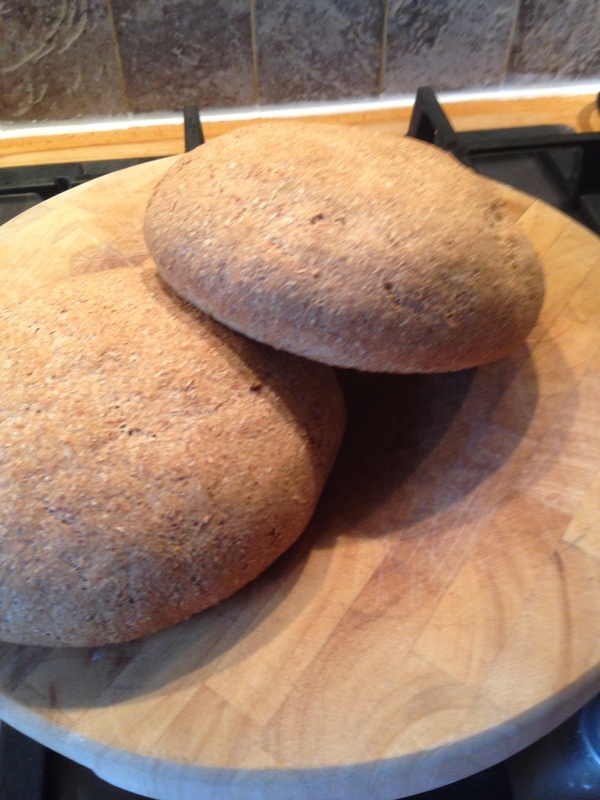 So at least with this one you can be guaranteed it’s all wholemeal! 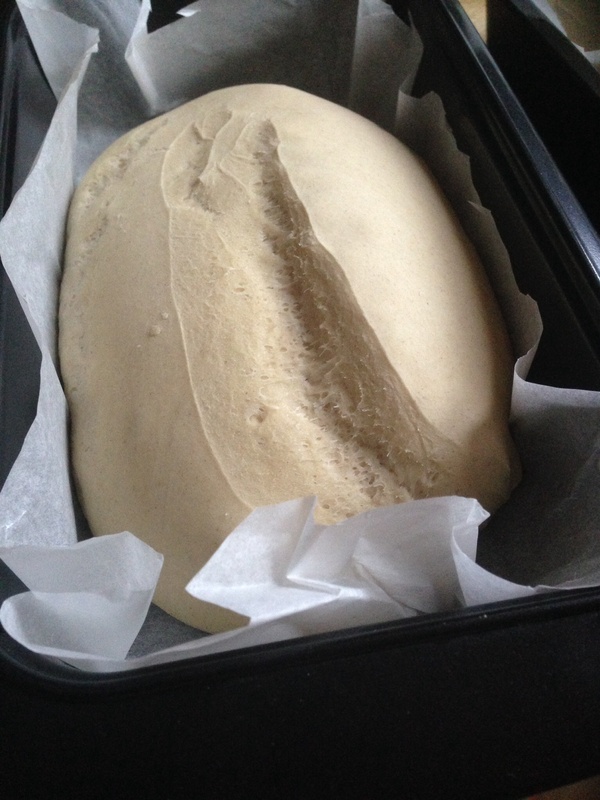 I know the whole bread making process is a bit time consuming but if you have the time it’s worth it. 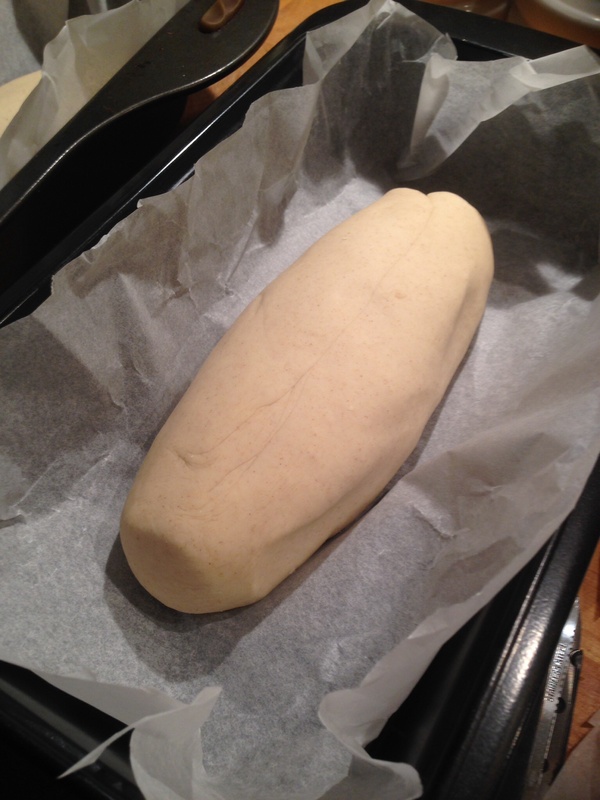 I started this first thing, left it till about 11 to rise and then was in the oven at 1. 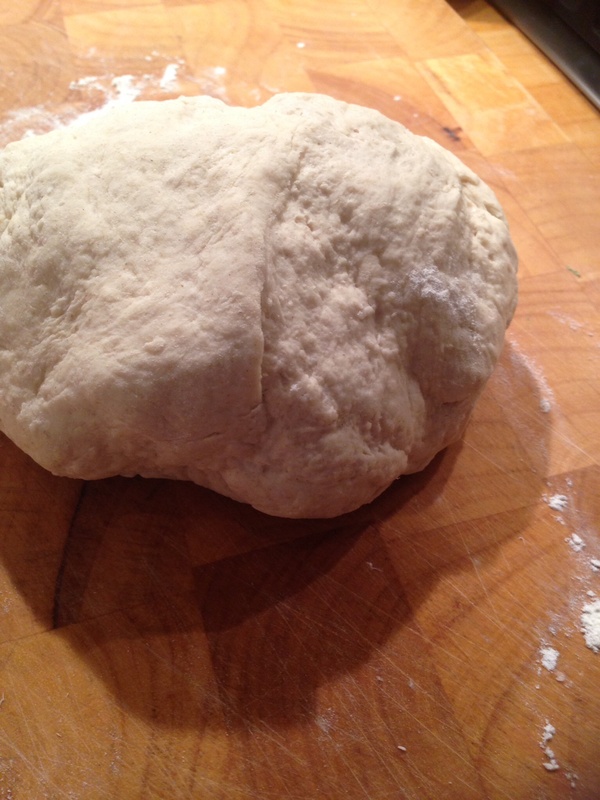 It was hard to make sure I had the dough smooth enough at the kneading stage. 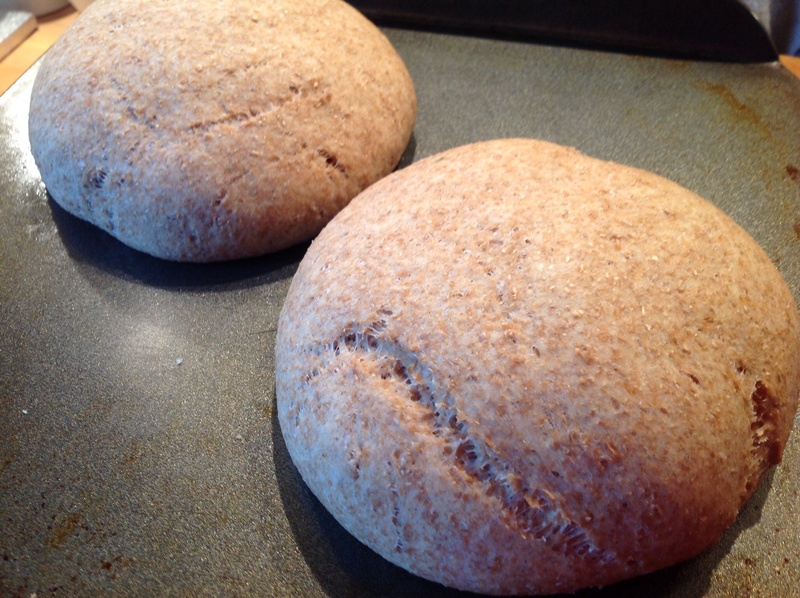 The grains if wholemeal make it harder to tell. 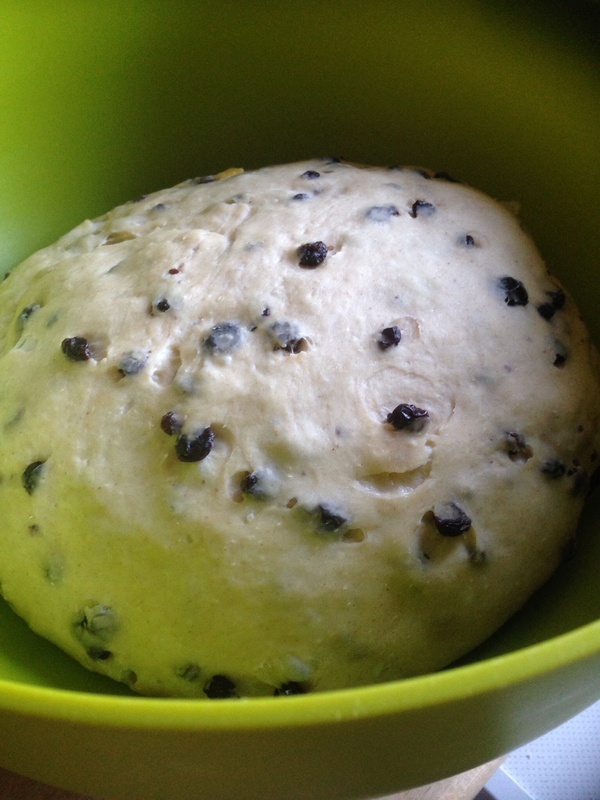 This did rise really well and was more than doubled after the first rise. 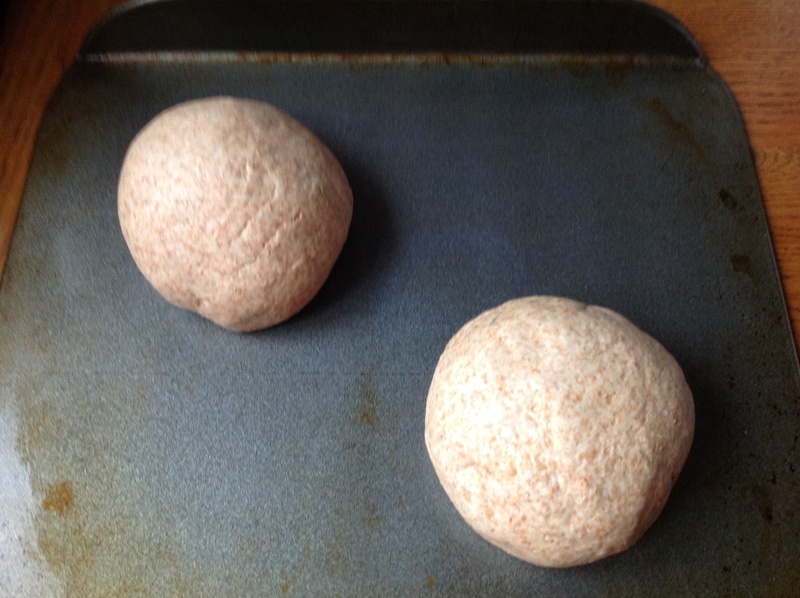 I have two different shaped loaf tins, that’s why my loaves are different shapes! 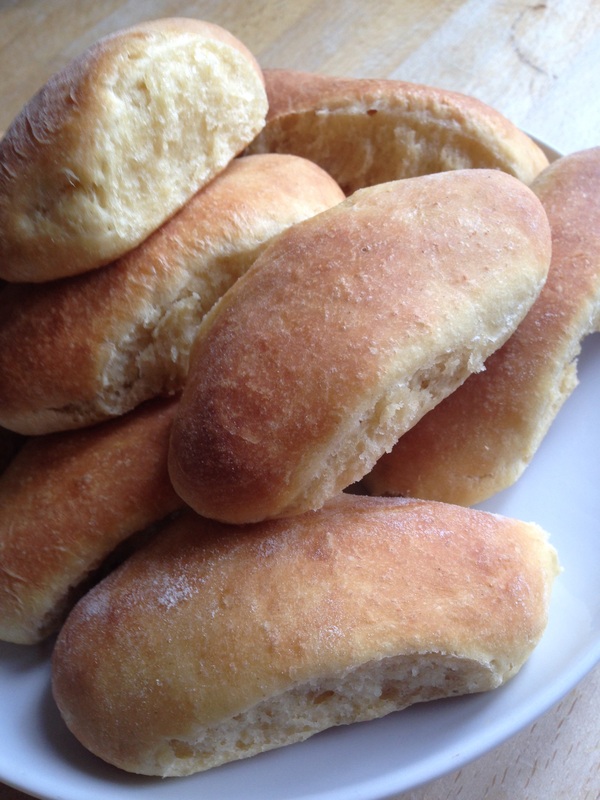 I have to say there is nothing better than a slice of homemade bread warm from the oven simply spread with butter!! 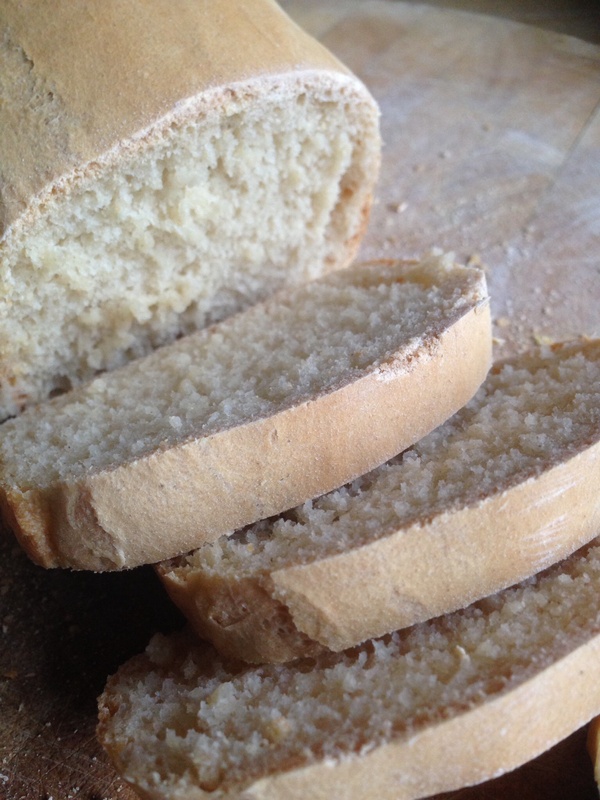 This bread is lovely, it’s nice and light but it has a decent crust. Would I make this again? 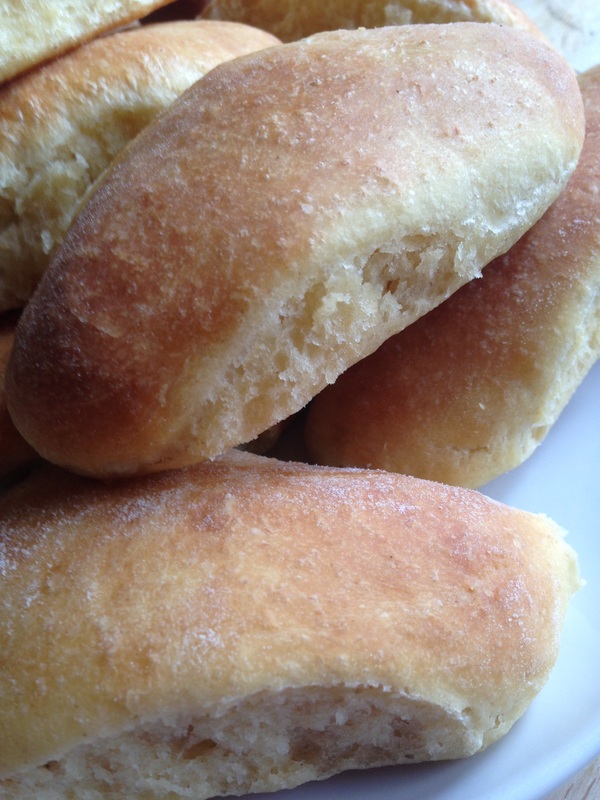 Yes, can’t beat homemade bread!